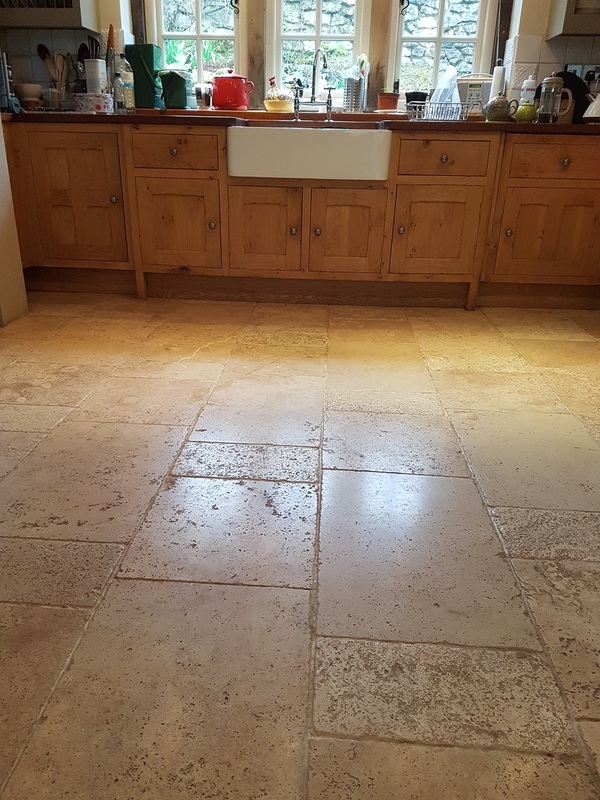 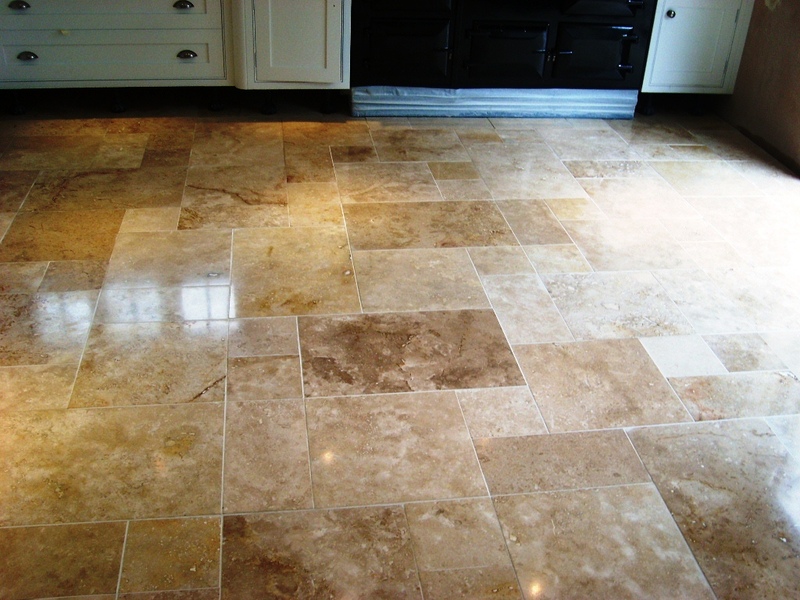 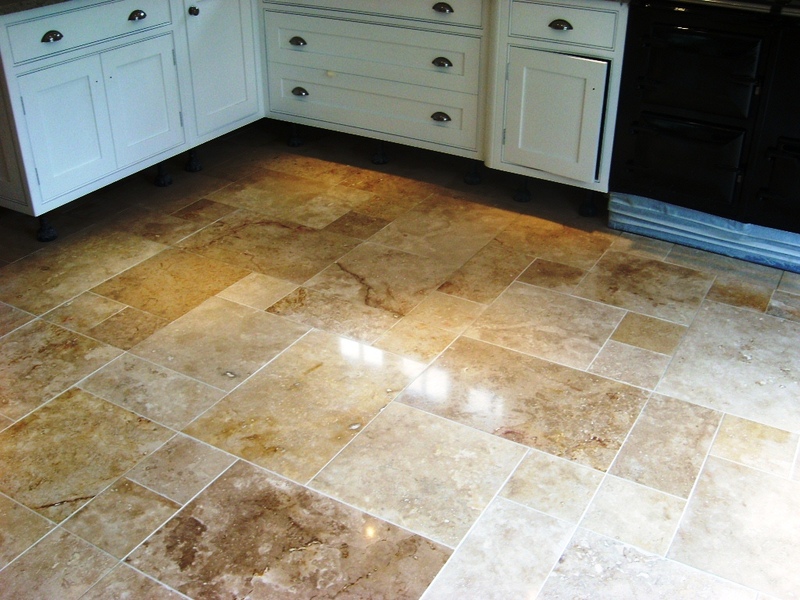 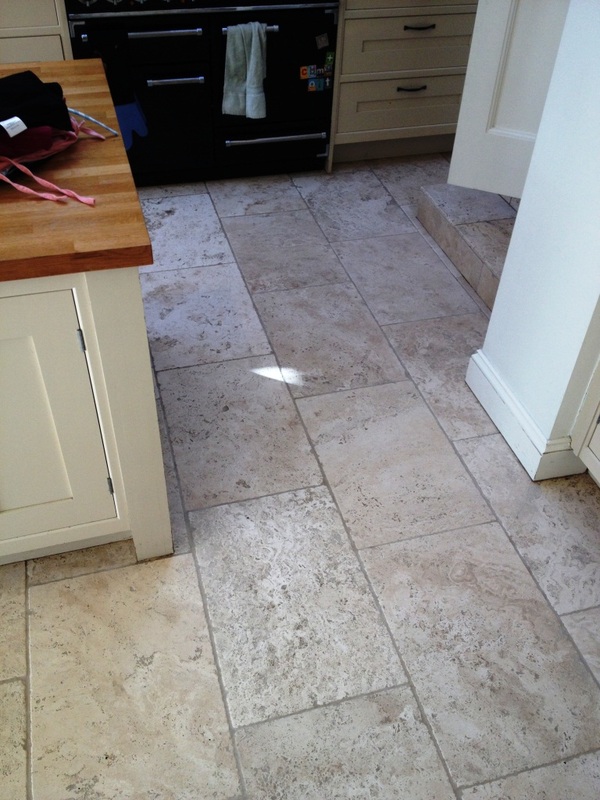 Pictures below of a Travertine tiled floor in East Grinstead which had been laid some years earlier and over time had become dull as it lost its polished appearance with wear. 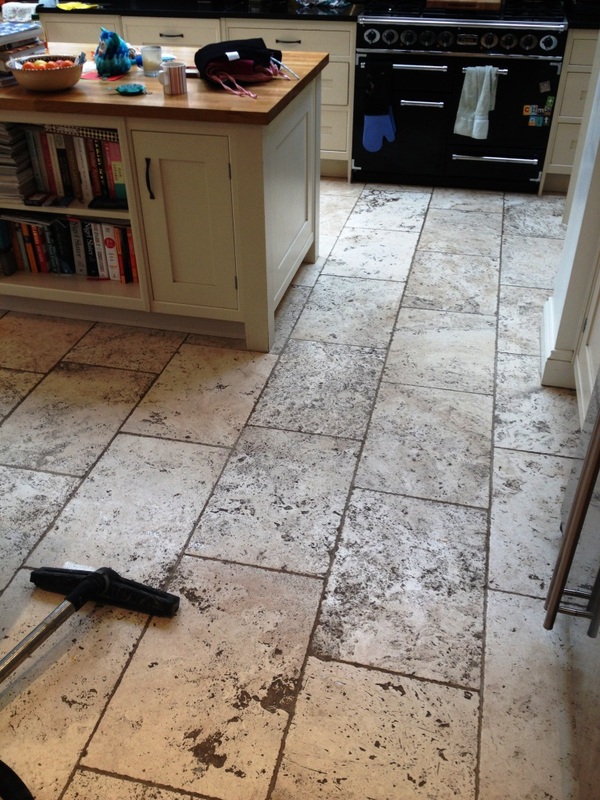 The customer had tried cleaning but could not get the floor looking the way they it used to. 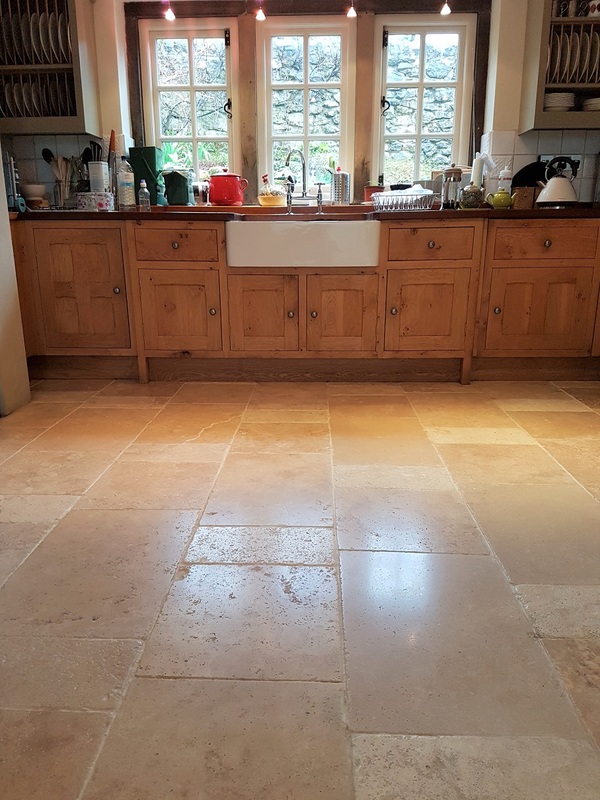 To restore appearance on polished hard stone floors such a Travertine and Limestone they have to be cut back and polished with floor burnishing pads, it’s a similar process that you use on wood where you start with coarse sandpaper first and moving on to a finer grade towards the end. 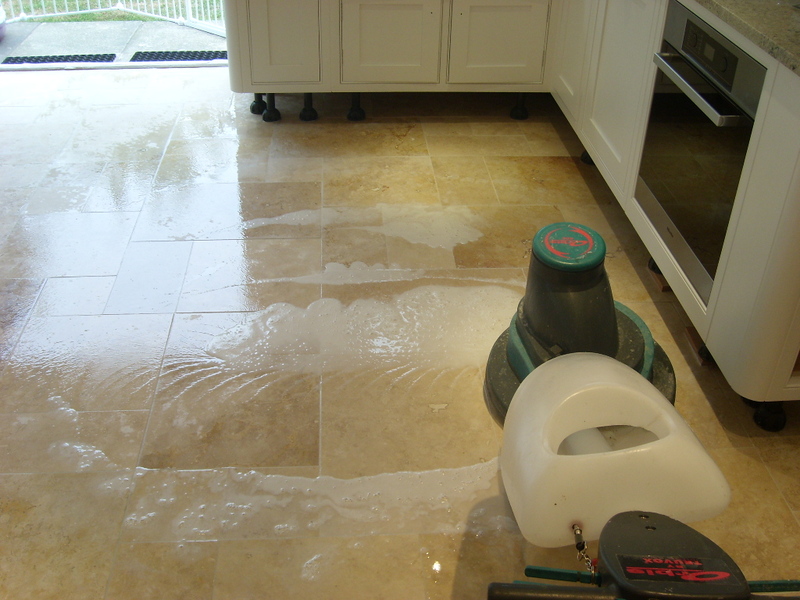 At Tile Doctor we have access to a diamond encrusted burnishing pad system which starts with a coarse red pad applied together with a little water, the coarse pad cleans the tiles and removes any topical sealers or ingrained dirt that may have been present. 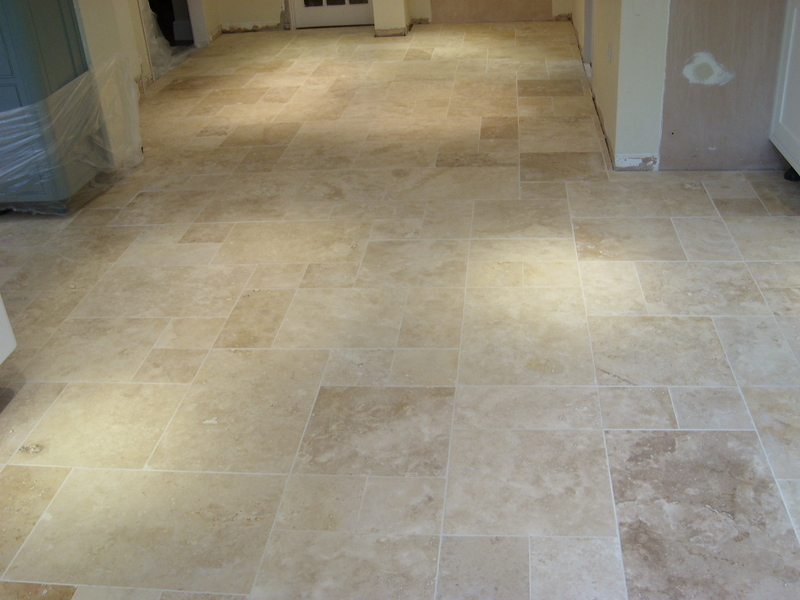 Next comes the white then yellow pads which are a finer grade again applied using nothing but a little water. 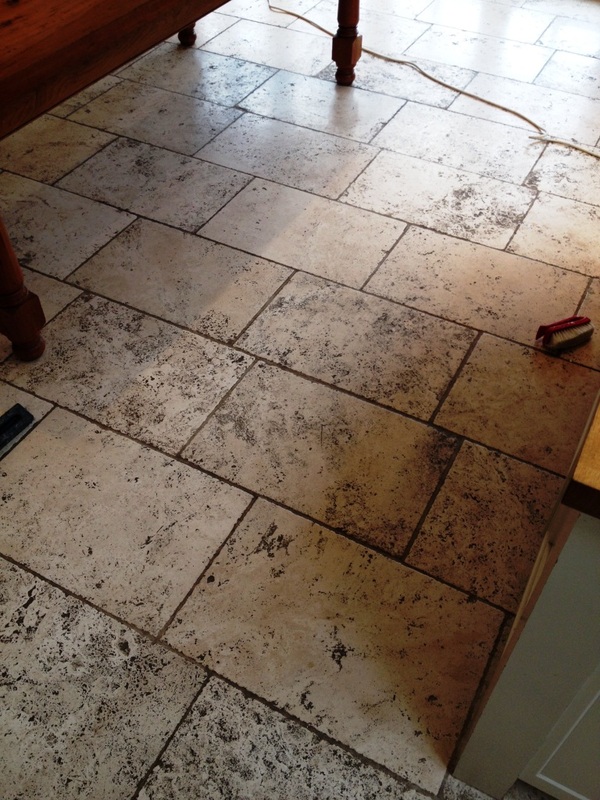 Before applying the final green polishing pad the grout lines need to be cleaned for which we use a solution of Tile Doctor Pro-Clean worked in along the grout line by hand with a stiff brush. 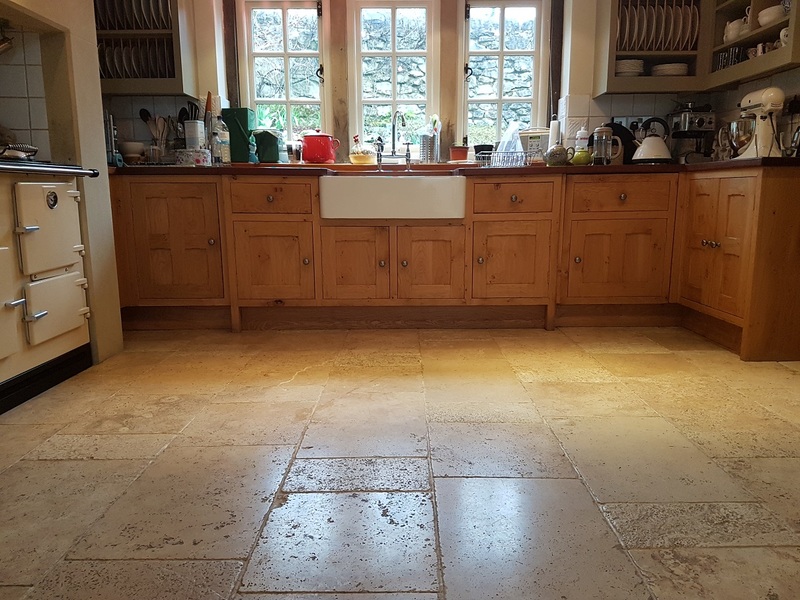 Last step of the cleaning process was to rinse the floor of any dirt picked up by the pads and then when the floor is dry the last green polishing pad is applied to add a shine to the floor. 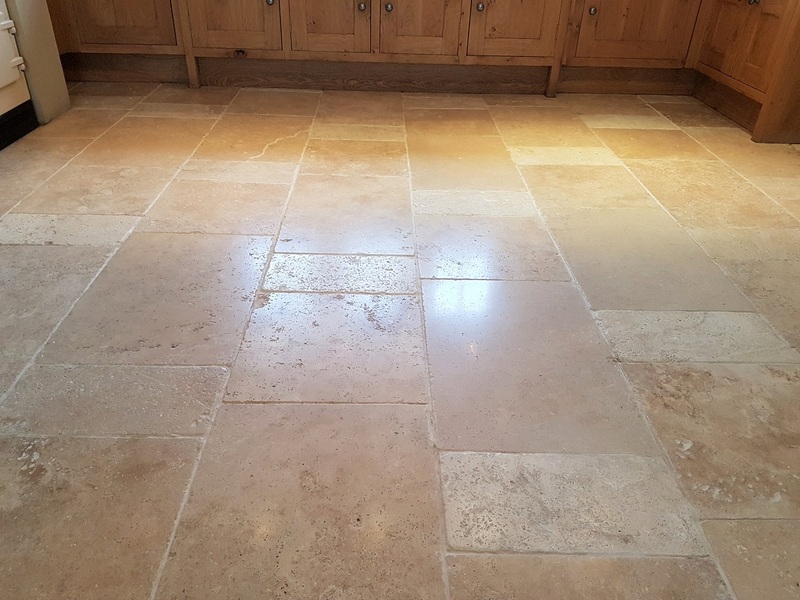 To protect the travertine it was sealed using a single coat of Tile Doctor Colour Grow which is an impregnating sealer that helps to bring out the natural colours in the grain of the stone. 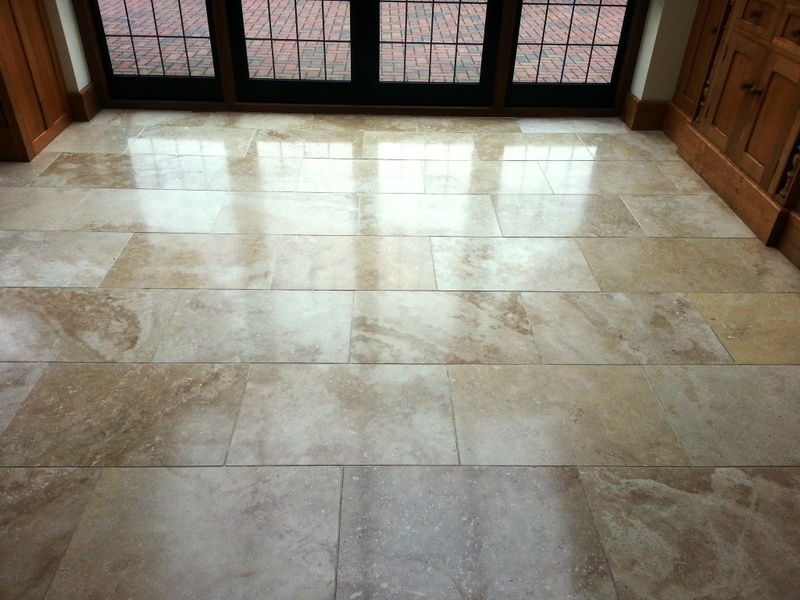 Once it was all dry again I buffed it up again but used a soft white buffing pad. 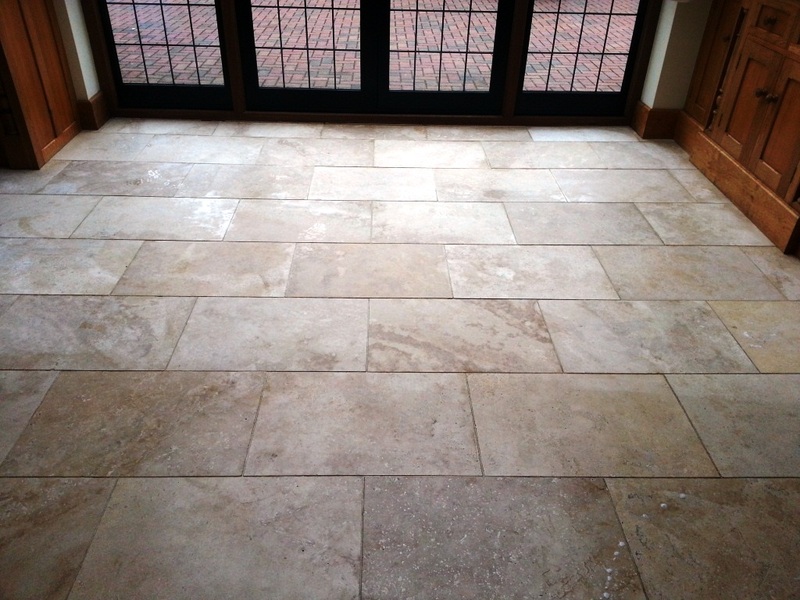 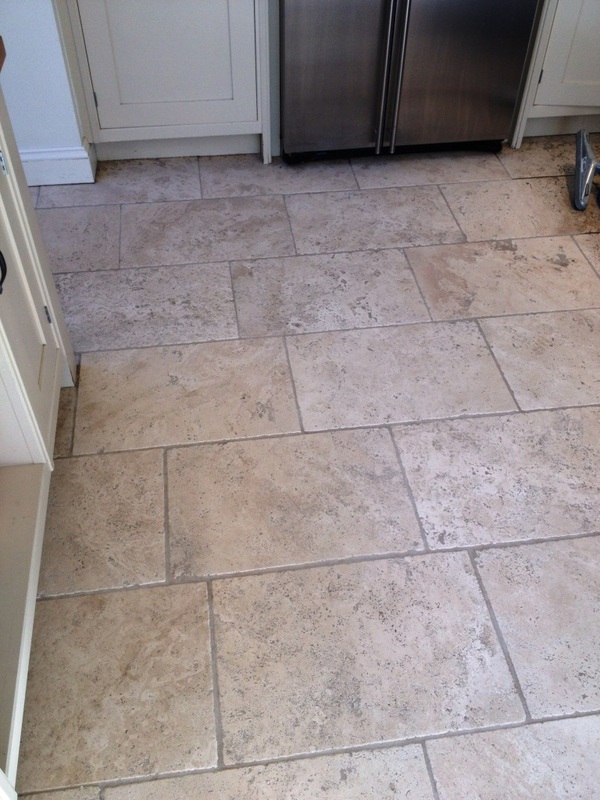 The photograph below was taken after we had finished and you can see the shine in the Travertine and how much cleaner the grout lines are.